Hungarian Skywatcher Tamas Ladanyi of The World At Night (TWAN) took this stunning photo of the smallest full moon of 2011, which occurred Oct. 11. 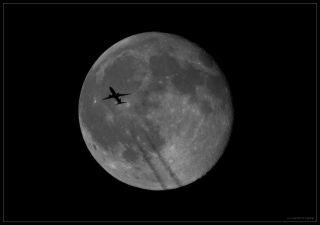 An airplane appears unusually large against the smallest full moon of the year. Hungarian skywatcher Tamas Ladanyi of The World At Night(TWAN) managed to capture this spectacular image Oct. 11, 2011. "The October full moon's beautiful celestial spectacle served despite the fact that the planet was at the furthest," the astrophotographer wrote on his website. This full moon's rather puny October appearance is 12.3 percent smaller than when it came into view in its most super-sized form back in March of this year. The moon seems to change size to us because it has an elliptical orbit. The moon in this photo appears small because it is at apogee, the point where an object is at the greatest distance from the center of the Earth. When the moon appears large it’s closest to Earth at a point called perigee. It takes a "synodic" month or 29.53 days between one full moon to the next. However, the time it takes for the moon to go from perigee to apogee and then back again to the closest point to us is called an "anomalistic" month. This is usually 27.55 days.